Minus Side: It's really quite dense. This is not light reading. Not at all. It is leavened by the occasional anecdotal story about congregational life, but it's mostly meat, written in language that tends towards the academic. It goes hard and heavy into some of the most significant findings of congregational researchers, occasionally to the point of being a bit inaccessible. For a well educated layperson, this might work...but it feels very much like a text that speaks at the graduate level. It isn't a book you can rush through in one sitting. Or two. Or five. I liked it, but for some, that might make this inaccessible. Minus Side: It can feel a bit cluttered. As it reviews and presents most of the literature on congregational life and dynamics, it sometimes gets a bit overwhelming. With multiple typologies of church types and dynamics, it presents faith communities in such a multivalent way that establishing a clear set of metrics for measuring congregational health can get a bit challenging. It comes at congregational life from so many different directions that it can be a bit dizzying. There's intentionality in the structure of the book, but sometimes it feels a bit like drinking from a churchybook firehose. Plus Side: It is thorough. On the flip side to the above, it really does provide a complete review of congregational research. Typologies that lay out the impacts of organizational size, internal structure, congregational self-image, and spiritual style are all presented. Of all of the books that I've gone through for my interim training prep, this one has felt the most useful. It really does open up the breadth and depth of congregational life. Plus Side: It resonates with reality. Many academic works feel like just that...academic works, full of theories and concepts that exist in the Platonic realm of church forms, but have no connection to how things are. With this book, I lost track of the number of times I scribbled things like "Yes!" and "Exactly!" and "That's so true!" in the margins. The ways that Galindo opens up church decision-making, organizational stumbling blocks, and other elements of how congregations function (or don't) is profoundly grounded in the actuality of church life. Having grown up in a large church, and having served both mid-sized and small congregations, I see a tremendous amount of truth in Galindo's research-based insights. Plus Side: It's not just for interims. 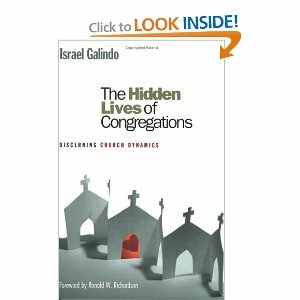 Though referencing much of the same literature as the other interim books I read, The Hidden Lives of Congregations approaches congregational life in a way that does not assume you're only there to facilitate a transition. It's more of a generalists book, something that is designed to be broadly useable by anyone in a position of congregational leadership. This is repeated, reiterated, and restated as the primary and governing purpose of congregations. Which is good, because it is. Not sure why it is that Galindo seems better at this than others I've read. Maybe...um...because he's Baptist? Hmmm.